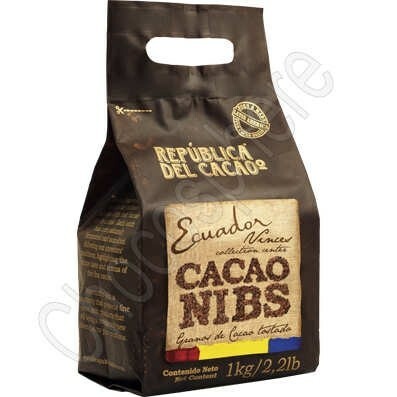 Republica del Cacao's cocoa nibs are roasted bits of Ecuadoran-origin cocoa beans. The flavor of these cacao nibs is intense with a touch of bitterness, plus toasted notes and a very slight acidity. Cacao Nibs are versatile and can be used for bean to bar chocolate making projects, for decoration, and for culinary and pastry applications. Try them when you want a crunchy, cocoa flavor as part of your creation! The beans for these fine quality nibs come from no more than 100 Km away from Vinces in the province of Los Rios, where Republica del Caco has their collection center, enabling prompt processing for peak quality and freshness. Non-Meltable, can by shipped by ground all year. 1 Kg / 2.2 lb, original factory package.